Rancho Santa Fe is a hilltop hamlet a half hour north of San Diego, a sun-splashed Mayberry for the one percent. On a sleepy Monday morning in late May, amidst a procession of drop-top Bentleys and sleek Teslas, a middle-aged dude in shorts and flip-flops rolls down the perfectly quaint main drag in an unexpected vehicle: a black golf cart, with a leather Tour bag bulging out the back. He's wearing a Whisper Rock cap and carrying a huge Yeti thermos. Stepping into Caffe Positano, a temple of gourmet coffee, this jovial patron is sized up by the barista like Sam Malone might gaze upon Norm Peterson: "You want the usual, Phil?" In short order, five shots of espresso are poured into the concoction that Phil Mickelson had already brewed a mile away at his Mediterranean-style compound. Phil takes his coffee drinks very seriously, and with the help of a de facto sommelier has concocted a magic elixir that he says strengthens his immune system and helps him train better by reducing inflammation. It consists of coarse ground Ethiopian Yirgacheffe coffee, almond milk, cinnamon, cacao nibs, collagen and medium-chain triglyceride (MCT) oil, which is extracted from coconuts. "At my age, it's all about recovery," says Mickelson, 48. "To be able to practice as hard as you need to or to work out as hard as you need to, you have to recover. And it takes a little while longer at this age." Not that the Hall of Famer has grown complacent: He had gotten up this morning at 5:30 to hit the gym and followed that with an hour and a half of short-game work. Phil takes a seat at a sidewalk table, the better to sip his coffee and hold court. He's in a wistful mood. His wife, Amy, is across the country at Brown University, helping eldest daughter Amanda move out of her dorm room at the end of her freshman year. Like her father, Amanda is an eclectic personality with myriad interests, including Egyptology, her current major. "She says Brown is the first place she feels like people ‘get' her," Phil says, but as thrilled as he is for his daughter's intellectual growth spurt, he is eager to have the family reunited. Sophia, a dancer and an artist, is finishing up her sophomore year of high school. She already has her driver's license and often shuttles to school her little brother Evan, a freshman who has gone to coding camps and regularly invents his own video games. Getting cut out of car-pool duties has been hard on Phil — he loved the chance to chat with the kids during the drives. But on school mornings he can still occasionally lure them to breakfast at their favorite greasy spoons. Phil gestures over yonder, to an unseen restaurant with excellent pancakes. Once a Sun Devil, always a Sun Devil. 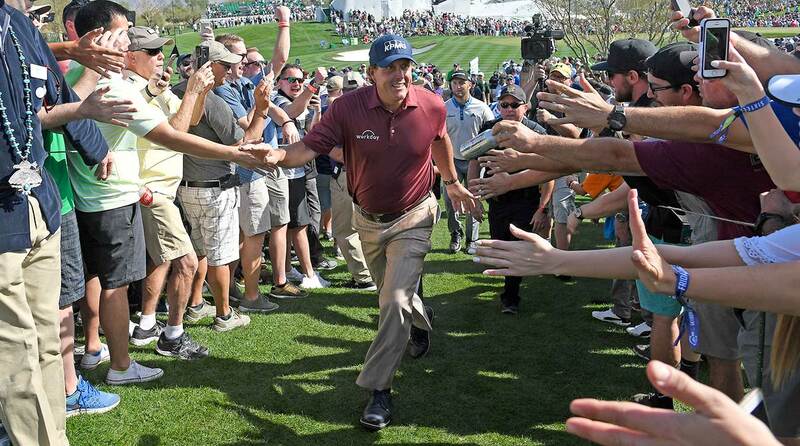 In February, Mickelson soaked up some Arizona love at the Waste Management Phoenix Open. It's hard to believe the one-time phenom with the rakish smile and upturned collar who won a Tour event as an undergrad is now only a couple of years away from being an empty-nester. But however pensive he may be about his children growing up, Phil can't disguise his excitement for this next phase of his life. He and Amy have already bought a piece of land adjacent to their current spread, where they will build a smaller, cozier house. Beyond that, "I'm looking forward to getting to date Amy again, once the kids are outta the house," Phil says with a grin. "We want to travel the world. Our plan is to live for three to six months in many unique and special places. That's going to be great fun." * * * * * By now it's 10 a.m., and Phil's stomach is growling, so we jump in the golf cart to head to his home away from home, The Bridges golf club. It will come as no surprise that his is not a regular cart but rather a souped-up version that has DirecTV and can touch 50 miles per hour. "Don't worry, it's perfectly safe and I'm a conservative driver," he says, unconvincingly. We tear off across the countryside, past large estates dotted with grazing horses. The tires are squealing on every bend in the road and Phil admonishes me for not properly leaning into the turns. At The Bridges, he greets every waiter and busboy by name. Though neither of us are Millennials, we order the avocado toast. Phil's commitment to healthy eating and exercising—he owns a black belt in Taekwondo—began around the time he hit 40. "If I look back to when I won the PGA Championship at Baltusrol in 2005, I was 15 pounds heavier, I looked awful, and here I am 13 years older and I'm in better shape," he says. "I physically feel better. I eat better. I take care of myself better. Most people regress. I feel like I've improved a little bit over time." Phil's victory at the WGC-Mexico City, in February, ended a nearly five-year drought, though in fairness he did shoot -14 or better at the 2014 PGA Championship, 2015 Masters and 2016 British Open, only to be beaten at all three by historic performances. The triumph in Mexico was the 43rd win of his career (ninth all-time). Phil has often talked about getting to 50 victories, which would take him into his early to mid-50s. He has already enjoyed a run of sustained excellence that is nearly unprecedented in all of sports: He was one of the best players in the world as an undergrad at Arizona State and three decades later remains a force in the game. (Nicklaus arrived in 1960, when he nearly stole the U.S. Open as a 20-year-old amateur, but after his victory lap at the '86 Masters he never won again.) If Phil had managed to make a bogey on the 72nd hole at Winged Foot in 2006, that would have been three major championship victories in a row; he calls that "my best run." Yet he says, "I actually do believe I'm starting to play better than that. Now does that mean that I'll have the results? I don't know. There's a very deep pool of players right now that hit the ball longer than 15 years ago, that have speed and great instruction and are just better players than we were 15 years ago. So how will that translate? I don't know. But I do believe I still have a couple more [victories at the] majors in me. Majors are easier for me to win than a regular Tour event, I would say. Raw power is not as important and experience is more important." 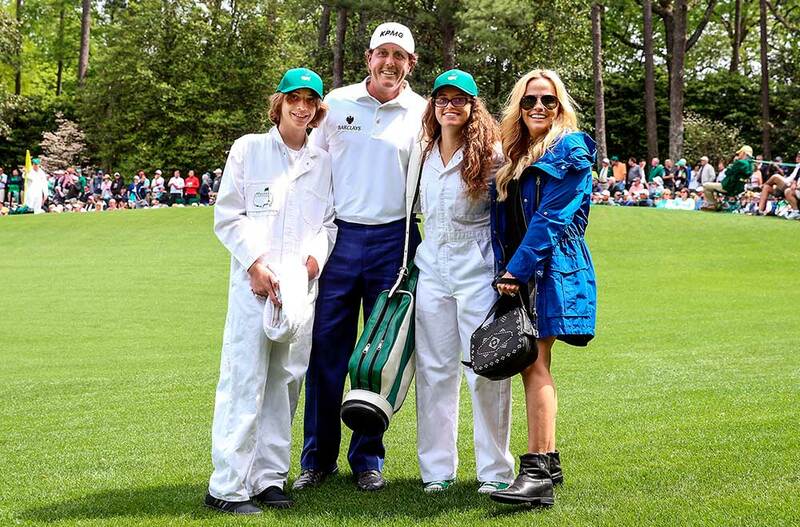 Phil — with his wife, Amy (far right) — is now a parent of three, including temp Masters caddies Evan and Amanda. His phone bleats and he excuses himself to take the call. On this day the negotiations are hot and heavy for a big-money, made-for-TV match versus Tiger Woods to be played a few months later, under the lights in Las Vegas. Both Phil and Tiger grew up in Southern California suburbia, separated by five years and 100 miles. Their rivalry has been a lifetime in the making, but the proposed $10 million death match was born in a sterile press room in Scotland four years ago. In the charged moments following the United States' loss at the 2014 Ryder Cup — making that six defeats in the last seven Cups — Phil put his name on the line by calling out the mismanagement of captain Tom Watson and the bungling bureaucrats at the PGA of America who had enabled him. Tiger didn't play in that match, but he readily signed on to the Ryder Cup Task Force, which, after Phil's comments, was hastily assembled to reform the culture of futility. Woods and Mickelson were the dominant voices on the Task Force, and this meeting of the minds began a long-overdue détente between golf's biggest stars. * * * * * In early 2015, when Tiger was suffering through the chip-yips, Phil reached out and offered to help. Given their previous frostiness, it was a gesture of deep empathy. Throughout 2016, they maintained a steady correspondence while exchanging ideas about that year's Ryder Cup, where Tiger would serve as a vice captain and Phil the team leader. That week at Hazeltine, Mickelson knew his reputation was at stake, and he was deeply moved by Woods's activist support. "He was big a part of everything," Phil says. "He's been a great vice captain because he's so detail oriented. Guys listen to him and respect him. They look at him with awe and admiration. When he says something, it's taken very seriously. And so having his input and his voice be heard more was a big deal for us [in 2016] and continues to be." The friendship blossomed from there. Tiger texted encouragement and support after every one of Phil's rounds in Mexico City, and when it was over he offered heartfelt congratulations. Of course, their correspondence is not always so syrupy. In private, both Tiger and Phil are preeminent trash talkers, though Mickelson has often found himself rendered mute by his rival's thumbs. "The tough thing is that he has the trump card: his career record. Okay?" Phil says. "Whether it's 14 majors, 79 wins, however many player-of-the-year awards, FedEx Cups. He owns all the trump cards. So I have to be very careful and strategic in my smack talk, because if I lay something down, in comes a trump card, you know, and that shuts me right up." This improved chemistry figures to be on display at this year's Ryder Cup in France. Their famously frosty pairing in 2004 was sprung on them by their clueless captain, Hal Sutton, but this time around Phil and Tiger will be better prepared. Their practice round at the Masters — incredibly, the first casual game they'd ever shared on Tour — was hardly an accident. As usual, Phil was playing all the angles. He waited until that Masters Tuesday, with the world watching, to bust out his dress-shirt look, the better to move product for a new endorsement partner (though Phil says he's always loved looking at old photos of Bobby Jones and Walter Hagen and their contemporaries, and he noted they looked quite snazzy in long-sleeved, button-down shirts). 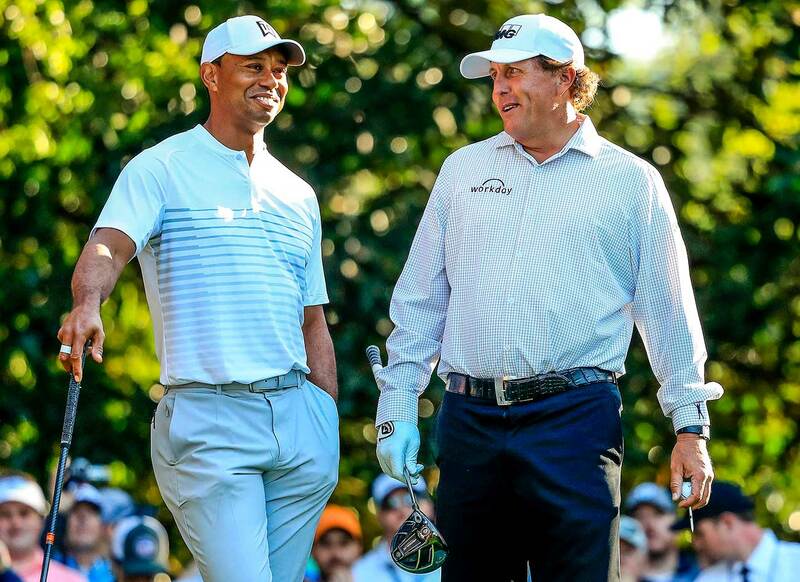 At the '18 Masters, golf’s arch-rivals played their first-ever practice round together, and Phil’s shirt was all business. He has other passion projects, notably a golf course he designed outside of Calgary that is opening this summer. If you want to make Phil blush just ask him the name of the course: "Well, I didn't pick it. The owners did. I mean...it's...the name...they're calling it Mickelson National." The large TVs in The Bridge's restaurant are suddenly showing an interview with Clint Eastwood talking about his movie The 15:17 to Paris, which piques Phil's interest. The flick received only mixed reviews from critics, but he says, "I really enjoyed it. Of course, I'm not a very good movie critic in that I'm not critical. I like 'em all. Except the movies that win awards, like The Shape of Water — I just didn't care for that. A love story with a water alien? I just didn't get it. I actually had dinner with Clint one time, and he was raving about La La Land. So I watched it, and I'm like, 'That was miserable. That was the worst frickin' thing I've ever seen.' So obviously my movie prowess is not very good." I mention that a few weeks earlier Golf Channel analyst Brandel Chamblee had taken to Twitter to offer a passionate testimonial about La La Land. "Oh, see, that makes perfect sense, 'cause he and I don't see eye to eye on anything," Phil says. "I was afraid you were gonna say we felt the same way about something, and that would've thrown me for a loop." I ask if he and Brandel have some history I didn't know about. "I just like people who build up the game," Phil says. "I view this as we're all in the game of golf together. We all want to grow the game. We all want to make it better. And I feel like he's made his commentating career on denigrating others. And I don't care for that. I like people who help build the sport up and promote it for what it is, rather than tearing down and ridiculing others." The harsh words hang in the air, so I quickly ask what he thinks of his former caddie Jim "Bones" Mackay's work as a reporter for NBC/Golf Channel. "I haven't really had a chance to listen to him 'cause I'm usually playing. But from what I've heard, he's really good. And people like that different perspective. And he seems like he's really happy." Does he miss anything about his presence on the bag? Phil demurs, preferring to talk about his new caddie, his brother Tim. "He is extremely funny," he says. "He and I have a very similar sense of humor. We often say the same punch line simultaneously. So naturally, I find him extremely funny. And we have an incredible energy together. We work well together, but more than that, we just enjoy being around each other." While at Arizona State, Mickelson won the NCAA Golf Championship three times — and rocked a sweater like the letterman he probably was. 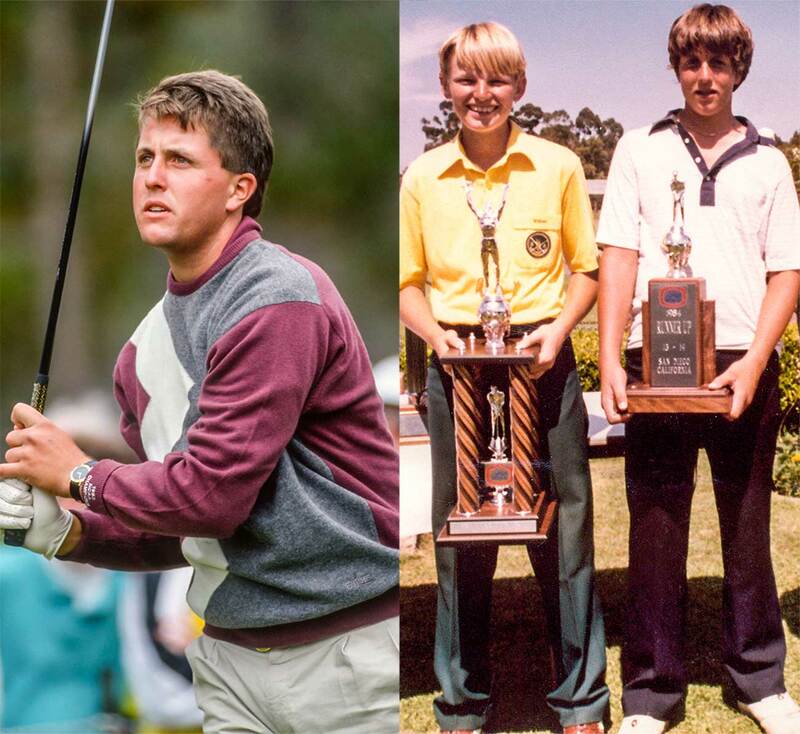 Right photo: Phil was barely a kid himself when Ernie Els (left) skunked him at the 1984 World Junior Golf Championship. A defining moment in their partnership came on the 72nd hole in Mexico City, as Phil was waiting to attempt a do-or-die 3-footer to force a playoff. "I was standing on the back of the green and he came up behind me and whispered in my ear. He didn't mess up my concentration, he just whispered exactly what was in my head: ‘Control your breathing and connect with the target, connect with the hole.' It's exactly what I was thinking. And so he's very in sync with me and that brings out my best. "Having been a college coach for so long, he very much understands the strategy of when to attack, when not to. And he can identify when my game is sharp and when I should be goin' for it. I'll say, ‘What do you like off this tee, Bro?' And he'll say, ‘You've been drivin' it great — why would you hit anything other than driver?' That fills me with confidence. But if I'm going to hit a club or hit a shot that is not the smartest, all he has to say to me is one thing and it resonates: ‘Bro, the math doesn't add up.' That's all he has to say. The words you choose and how you communicate them elicit a certain response. If he says to me, ‘That makes no sense,' that elicits a defensive, I'll-show-you response. But the math not adding up, that resonates and forces me to reassess the cost/benefit. It's a subtle thing, but it's powerful." * * * * * The conversation meanders here and there. Phil's brain is full of miscellanea — at one point he tosses off the stat that the earth's population is growing 1.9 percent annually, so it will double every 40 years, or until such growth proves unsustainable. He looses a riff about time travel and black holes that I can't really follow, and he casually mentions that in 20 years he expects humans to have "terraformed" Mars, and he is looking forward to visiting. Occasionally he grabs my phone and presses pause on the voice recorder and tells me something juicy and/or profane. He seems utterly relaxed in the midst of two weeks off between the Players and the Memorial. Turns out much of the time will be spent enjoying his regular games. He'll drive to Temecula to peg it with Tom Pernice at Bear Creek, or travel to Irvine to play with Brendan Steele and John Mallinger and Luke List at Shady Canyon, or host Charley Hoffman at The Bridges. "You just want to compete," he says. "The smack talk, the bets, the whole thing — that's the fun of it." But as always, Phil is looking for an edge. "When you play with Luke List, you realize how great a driver of the golf ball he is and how much area for improvement there is in your own game, so afterward I go back and work on that. When you play with Tom Pernice, you realize how good he is with the wedges so, okay, I need to get my distance control better. It gives you direction on how to improve." 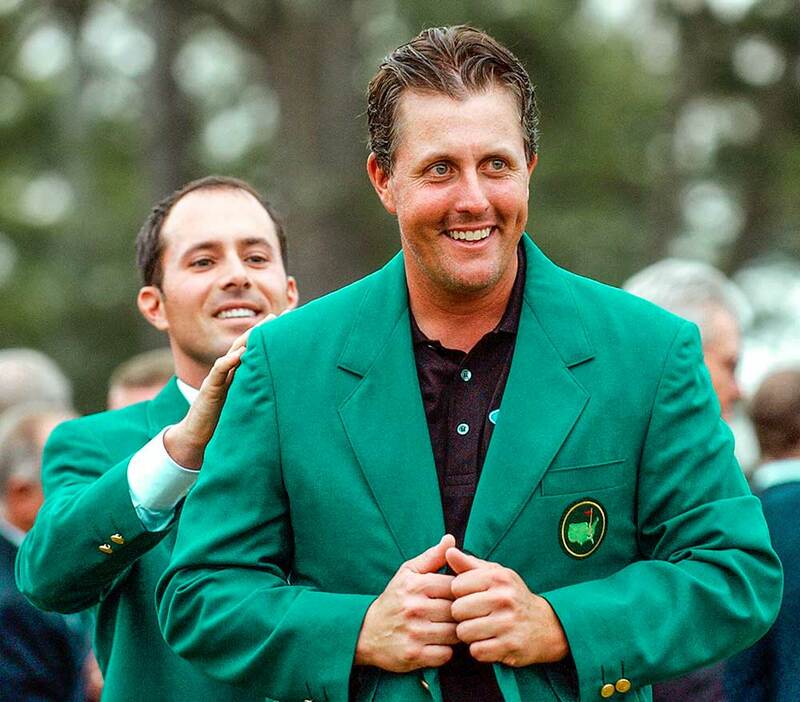 The first of Phil’s five majors — the 2004 Masters — may still be his sweetest. Mike Weir certainly thought the jacket was fitting. Phil begins to describe an ornate putting drill when he gives up and says, "Let's go to the house and I'll show you." The Bridges is a no-gratuity kind of place, but he discreetly slips a stack of Jacksons under the placemat for the server. Another death-defying drive in his golf cart ensues, and suddenly we are at Phil's place. It looks like an Italian villa, with the various dwellings made of stone and connected by beautifully landscaped paths. But the most impressive thing is his backyard practice facility, with greens of various grasses, bunkers with different kinds of sand and a series of artificial-turf putting surfaces. To work on his long game, Phil hits balls directly over a stone cottage that serves as a staff office, into an open field beyond. I ask if he has ever caught one really thin and doinked the cottage. He looks at me like I have three heads. Right, Hall of Famers don't do stuff like that. We step to the artificial greens and Phil notes that one is set at two degrees of pitch, the next at three degrees and the third green at four degrees. On each green one of the holes is encircled by balls, and Phil works his way around, stroking putts to demonstrate how the ball will tumble in from different angles. He grooves the feeling of these differing vectors and then once on Tour, with the help of a green-reading book that displays the pitch of each putting surface, he has already cracked the code of how any given putt will break. I have always thought of Phil's short game as pure art — who knew there was so much science, too? It is now deep into the lunch hour. Phil still has a few calls to make, and Sophia and Evan will soon be home from school. So we hop into the cart and roar back to downtown Rancho Santa Fe, where my rental car is parked. I thank him for his time. "That wasn't too painful," he lies. Then he tears off down the street, headed for home.